Other Common Names: Common juniper, fairy circle, hackmatack, gin berry, horse savin, gorst, aiten, dwarf juniper, genevier, mountain common juniper, old field common juniper, genévrier, ginepro, enebro, gemeiner, gin plant, wachholder, reckholder. 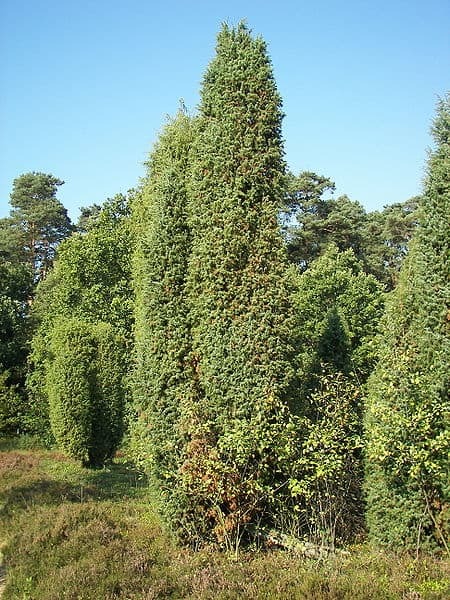 Habitat: Juniper is native to the northern hemisphere and is common in Canada, Scandinavia, and Siberia. It is usually found on heaths and moors but can also be found as undergrowth in mixed forests. Plant Description: Juniper is an erect evergreen coniferous shrub or a small tree which can grow up to ten meters tall. The needle like leaves, consisting of whorls of three, are light green below and dark green above. The plant bears female globose cones and small male cones on separate plants. These cones are usually referred to as the juniper berries. The green fruits appear on the female plant and take around three years to ripen, eventually turning dark blue or black in color. Plant Parts Used: The dried and ripe berries but sometimes the needles and leaves have been used for medical purposes. Juniper has been used traditionally to treat arthritis, gout and rheumatism. Test tube studies have shown that the berries can inhibit prostaglandin synthesis which indicates that this traditional use has some merit. Juniper has diuretic and antiseptic properties which explain its uses as an herbal remedy for urinary tract infections such as cystitis and urethritis. Modern studies on juniper indicate that it increases the filtration rate of the kidneys, dilutes the urine and disinfects the urinary tract. Other traditional medical uses for juniper berries are the treatment of intestinal infections, colic and other stomach upsets. Additionally it has been used as a medicinal herb for coughs, bronchitis and upper respiratory infections. In the German Pharmacopoeia the berries are listed as a treatment for dyspeptic complaints such as gas, heartburn, indigestion and flatulence. The herb has been used topically as a treatment for wounds, muscle aches, lesions and abnormal skin growths, and snake bites. It has been used as a remedy for delayed menstruation because it is thought to stimulate the uterine muscle. In laboratory conditions, the antiviral compounds have been found to inhibit the growth of a number of virus strains including herpes and flu strains. The ingredient podophyllotoxin may also inhibit abnormal cell growths. Juniper has antiseptic and astringent properties which explain why it has been used to treat acne and other skin blemishes. It has also been used in combination with other herbs to treat psoriasis affecting the scalp. It was shown to lower blood pressure by an average of 27% in rats and its ability to inhibit the formation of blood clots is being investigated. This herb does have some disinfectant properties and may act as a natural insecticide. It is probably best known for giving the alcoholic beverage gin its distinctive flavor. The berries are also used as a flavoring in pickling brine, stuffing, and for game meats, ham, and pork. 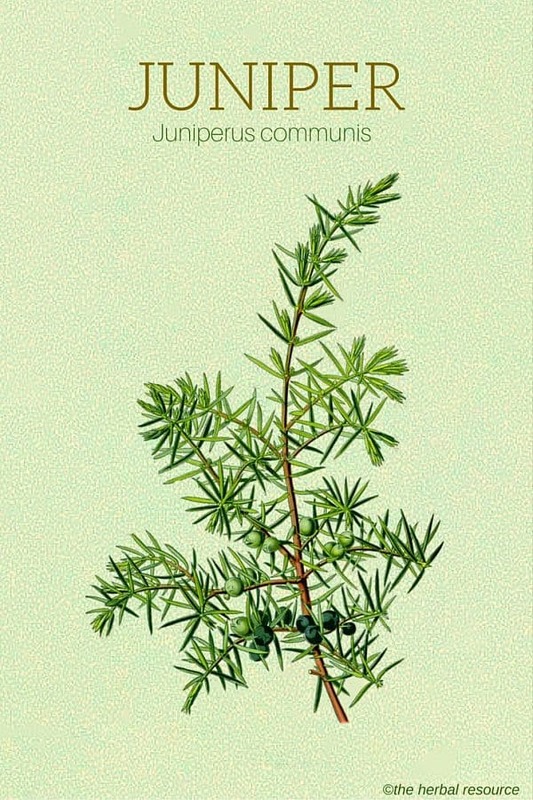 Juniper has a place in folklore. In Europe, the berries were burned for the last three days in April as a cleansing ritual and protection against sorcery. It was also believed that if it was planted beside the main door it would prevent a witch to enter if she could not count all the needles correctly. It is mentioned in the Bible as the tree that the Prophet Elijah hid under when he was fleeing from Queen Jezebel. 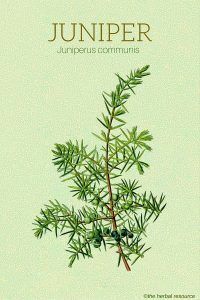 Juniper is available as an extract, a tincture, oil and as a tisane. A common dosage prescribed by herbalists is around 2-10 grams or one to three teaspoonfuls of crushed berries. These crushed berries are made into a tea by pouring boiling water over them and steeping for 10 minutes. The daily dosage is two to three cups for four weeks. This dosage corresponds to 20-100mg of juniper essential oil. 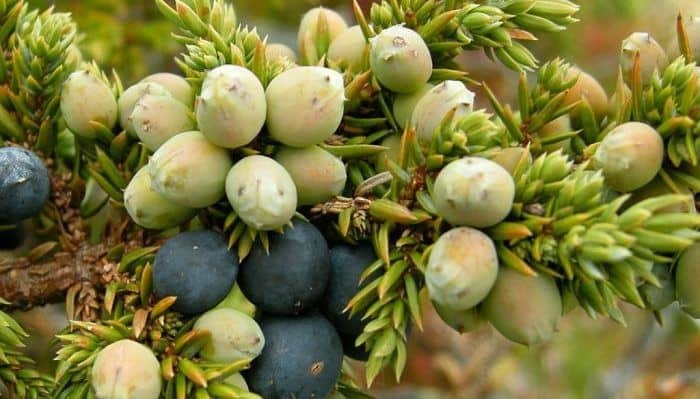 There are a number of contraindications for the use of juniper. The herb stimulates the contraction of smooth muscles and should therefore not be used by women who are pregnant. It should also be avoided by women who are nursing. It is irritating to the kidneys and should not be used by people with kidney disease or infection. 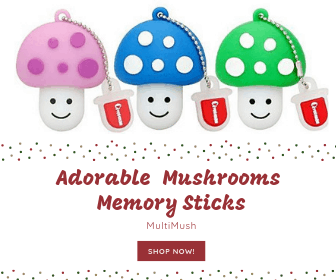 Since it may interfere with the action of glucose-regulating medication, it should be used with extreme caution in patients with diabetes or hypoglycemia. This herb should not be taken for more than six weeks as a tisane and use of the tincture or oil should be monitored by a physician or medical professional.